As a classically trained musician and composer, Florante Aguilar travels the world advancing and popularizing Philippine music through film, recordings, and live performances. When he and his wife, Fides Enriquez, a filmmaker and painter, wanted to create a space for intimate artistic events, they looked no further than their own back yard. 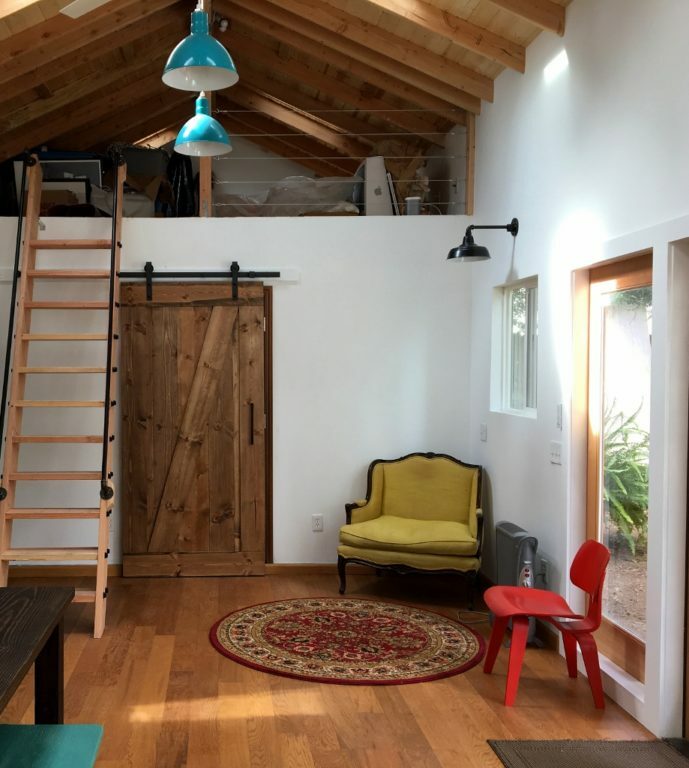 An old barn that once served as a greenhouse and storage space behind their home in Napa, California, was ripe for renovation. “Our home is located in an area called the Napa Abajo district where the majority of the homes have historical significance,” Florante says. 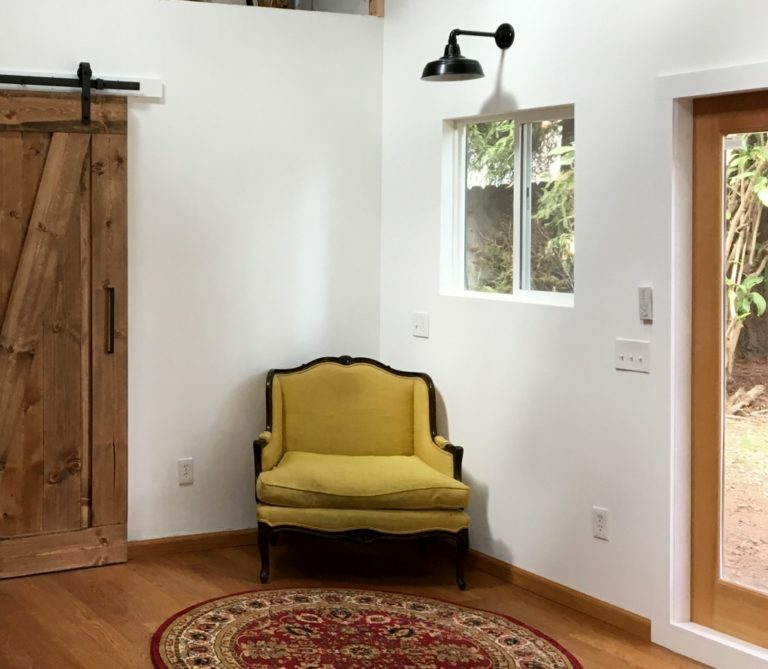 “We wanted to give a nod to the agricultural aspect of Napa Valley with a good balance of rustic and contemporary.” The old footprint was 320 square feet, and the couple enlarged it to just under 600 square feet by adding a music studio at the rear. 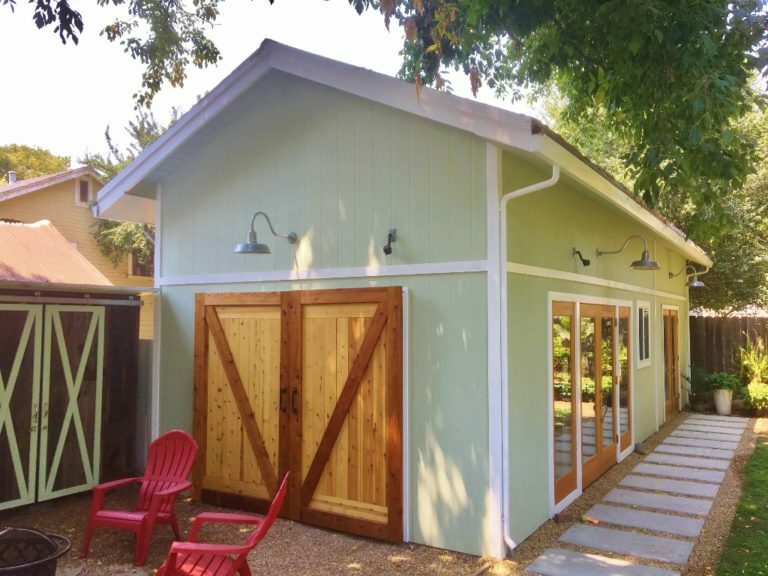 “We decided to keep the barn the same width even though we had the space to expand,” he notes. 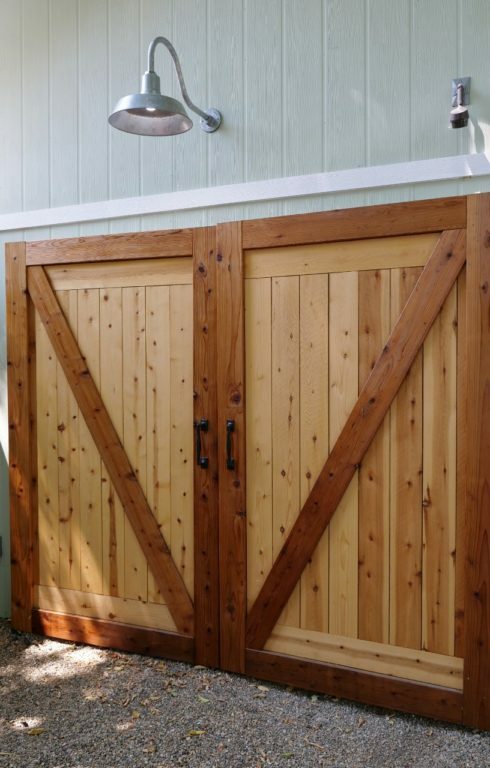 “We didn’t want to impinge on the openness of the back yard.” When choosing lighting, Florante searched for barn-style fixtures to complement the rustic feel of the space. “Lighting is such an important visual detail, and we wanted to preserve the barn feel,” Florante explains. 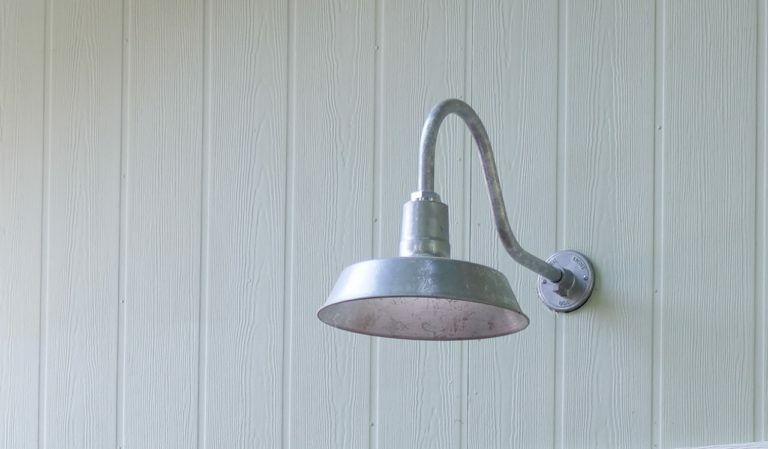 “I like American-made products, and no other company offered a wider range of color selections than Barn Light Electric.” For the exterior of the renovated barn, the couple chose the Original™ Warehouse Gooseneck Light. 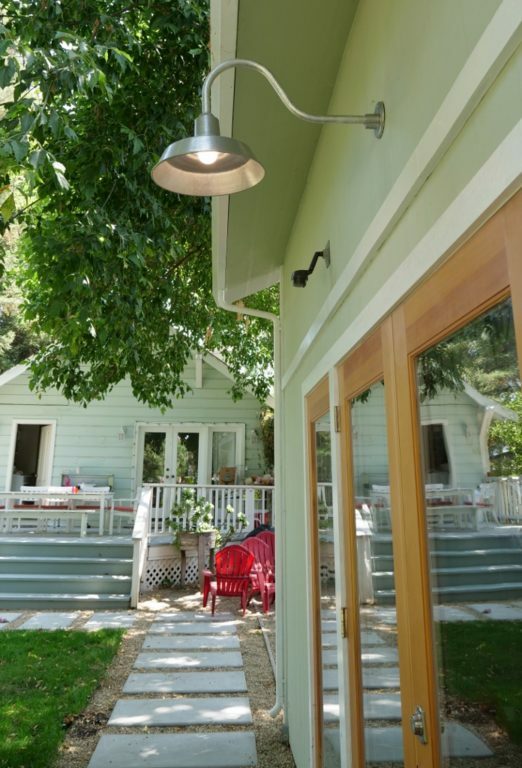 They customized these handcrafted lights with 14″ shades, a Galvanized finish, and G22 gooseneck arms. The interior of the space is designed to be multi functional with easy-to-move furniture. In addition to serving as the couple’s office, the barn attracts artists and musicians for intimate events. 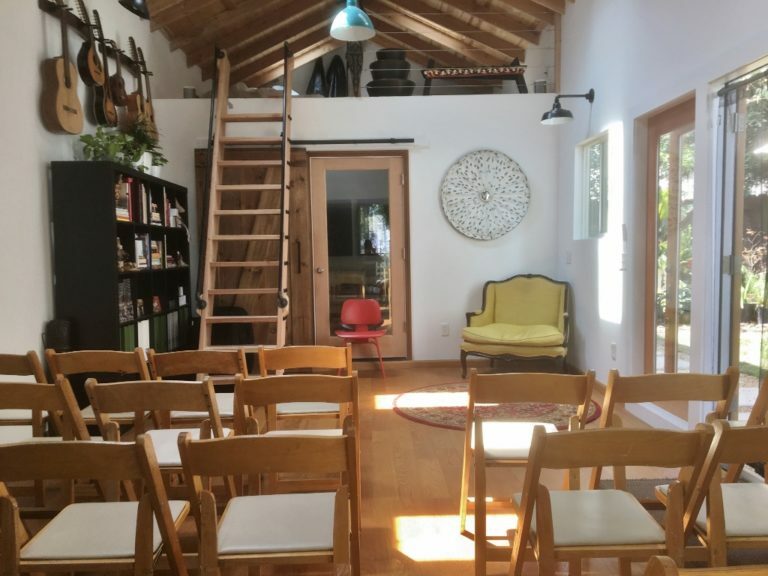 Once a month, Tiny Barn Sessions are held where artists test their ideas and works in progress in front of an audience in this cozy setting. 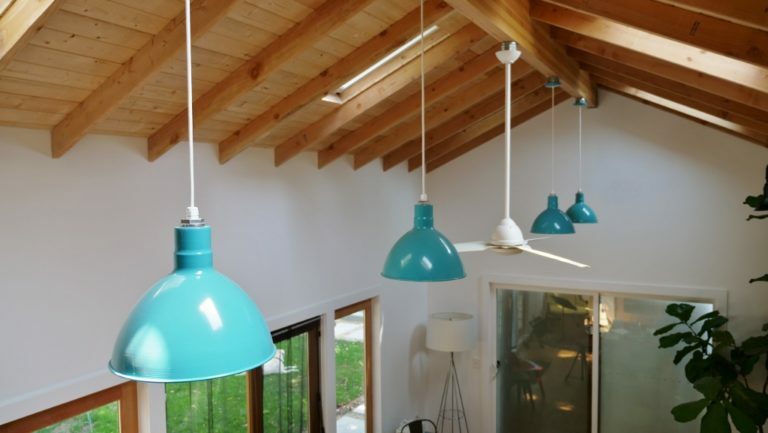 Four Wesco Cord Hung Pendants provide lighting over the main space and add a pop of color with their Teal finish. “I was looking for a contemporary pop of color among the sea of white paint and natural wood interior,” Florante says. “When I saw the Wesco Pendant in Teal, I knew its cheerful, bright hue would create the pop and contrast I was looking for.” These 14″ shades also feature a white cord making the shade itself even more pronounced. In the corner of the main room by a window, a chair rests beneath the glow of an All Weather Gooseneck Farm Light. The 11″ shade is finished in Black and extends from the wall on a G16 straight arm.